Accessible or inaccessible, lift or no lift, stairs or ramp, announcements or silence—these dualisms are inescapable in the daily life of those with limited mobility. Montreal’s first metro station opened in 1966. In 2014, seven out of 68 metro stations were accessible for those with limited mobility. At this rate, the Montreal metro will be fully accessible in 2090; in contrast, Toronto’s is set be fully accessible by 2025. 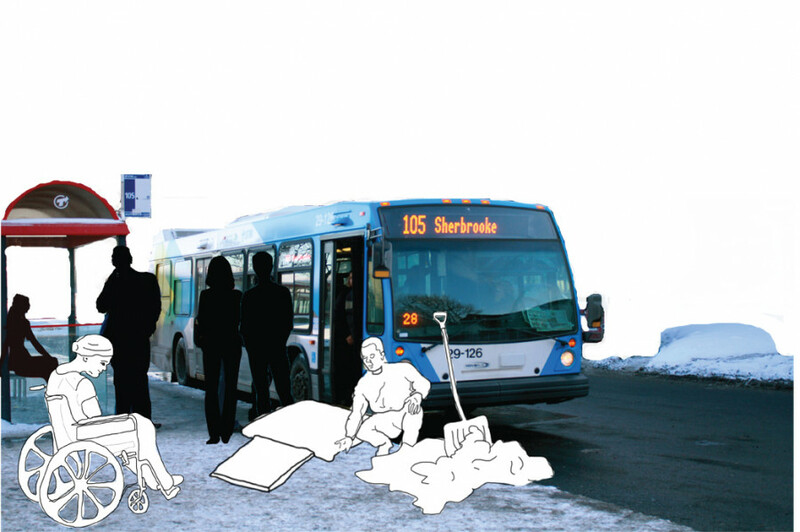 Is the STM guilty of transit discrimination as Accessibilize Montreal, a working group of the Quebec Public Interest Research Group’s Concordia chapter, claims? Or is it more a question of practical and economic feasibility? “Only a few public buildings are accessible and many restaurants and bars are entirely inaccessible,” said Paul Tshuma, a member of Accessibilize Montreal. “Whilst new buildings and shopping centres are made to be accessible, old buildings remain inaccessible. Figures vary in Montreal as to how many of us have limited mobility and a widely reported number does not exist—although it’s likely higher than most would think. If this is the case, why are they failing to deliver on the issue? Recently, pressure groups have been attending the STM’s monthly open meetings and repeatedly asking questions on the topic of accessibility. These efforts, unfortunately, have yet to yield any positive results. Accessibilize Montreal decries the fact that buses can only house one person using a limited mobility device; further, many buses have faulty ramps and drivers refuse service to certain clientele, such as people using mobility devices or who have assistance animals, in the absence of portable ramps. Often in adverse weather conditions (like we’re experiencing now) the sheer volume of snow by the curb and lack of training for STM bus drivers means that the ramps are essentially useless. Although Montreal mayor Denis Coderre says “universal accessibility is respected in 97 per cent of public buildings,” in a recent op-ed for the Montreal Gazette, Aimee Louw and Laurent Parent of Accessibilize Montreal question the figure. London has 66 of 270 tube stations accessible, along with a far more accessible bus service (perhaps in part due to a lack of snow); that figure is 111 of 468 in New York, while in Paris it’s a pitiful nine out of 303 stations. “Montreal is bad, but New York is even worse in terms of accessibility,” said Jason DaSilva, director of When I Walk, a documentary about accessibility. AXS Map, a crowdsourced app developed by DaSilva and Kevin Bleur, lists accessible buildings around you. It was described as a “game-changer” for people of limited mobility by Wendy Levy, former creative director of the MacArthur Award-winning Bay Area Video Coalition. However, governments cannot rely on the private sector to make urban areas more accessible. “There are a lot of ways that real estate owners [in New York] are able to resist making their buildings accessible,” said DaSilva. At Concordia University things are a bit brighter, but like most places in Montreal its infrastructure is not without its flaws. “Concordia is somewhat more accessible relative to Montreal; however, it still has a lot lacking,” said Noah Eidelman, staff member at the Quebec Public Interest Research Group at Concordia. Although there have been claims of a lack of protocol when fire drills and other evacuations have been undertaken, Concordia is certainly more accessible than most public buildings. Nevertheless, we shouldn’t congratulate anyone for being one of the best in a bad bunch. It should be the norm that buildings are entirely accessible.